This is one you should check out! This update is meant to remind us of who we want to be at our heart as Cedars Church. Since the merge, we have been working toward a goal: We want you who call Cedars home to be equipped to reach your inner circle. That is those 8 to 15 people whom you know and who know you. We believe that God has put you in their life to be a light of the gospel. We want you to know that God believes that you are fully capable (along with His spirit) to reach them for His glory. This does not mean that you preach at them, but that you do life with them. You tell them your story and you live out your story in front of them. We know that when we speak this way that it can bring up fears of inadequacy and lack of preparation. As a staff and leadership. That is why we are here to help. Please know that nothing will be as effective as you praying for them and asking God to help you reach them, but we want to help. This is the desire at the core of Cedars groups. We are not wanting to "educate", we want to equip. That is the call of Ephesians 4:11-12. In a discussion with a recent Cedars group, we asked this question: Do we pay our Lead Pastor his salary every week to only preach a 30-minute sermon, and then repeat that same 30-minute sermon the next service? For some, that is all they understand that he does. Or, is he called to lead and provide vision to a staff that equips the church to do works of ministry? Some would think that our ministries only happen on Sunday morning. This is simply not the case for our church. We are doing so much throughout the week to help our people reach those in their lives. We want you ready for the work that is before you. To do stand in the strength of the Holy Spirit for the lives that are right around you. Please note that we as a staff have owned this vision and are striving for it. First First are the steps that we have shared many times about reaching your inner circle. LIST your Inner Circle, those 8-15 people with whom you have developed, are developing or maybe should develop relational equity. PRAY daily for your Inner Circle, that each individual would sense God’s presence in their lives and be open to His love. to Himself and transforms their lives. INVITE them to spiritual interactions regularly and thoughtfully, as God opens doors of opportunity. This could be church,, but should not be the main thing to which you invite them. PREPARE to become a better example of faith in Christ as well as a more effective witness of His grace. 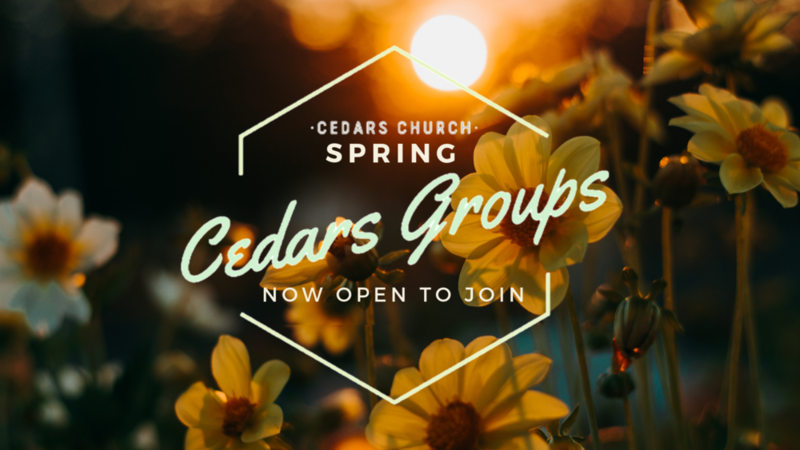 Second, we want you to click here to see all the Cedars Groups that are coming this Spring. Get ready because there are a lot of them! Pray so that you can see where you need to be most equipped to reach your inner circle. We as a staff are taking very seriously our call to equip you for the works of ministry. We hope that you are taking very seriously God's call on your life to be His ambassadors to a lost world. We are here for you and and want to walk with you. Newer PostApril's Bulletin is here! Check out what is coming up! Older PostWe want you to go to Mexico!